Verified Twitter accounts can be identified by the blue checkmark badge (shown in the image above) located beside full names on Twitter profiles, in feeds (including retweets) and in search results. As you might have already guessed, Twitter doesn't grant verification to just anyone, and the process of getting an account verified can be a lengthy one—especially now with public submissions put on hold until further notice. According to the official Twitter Verified and Twitter Support accounts on Twitter, public submissions for account verification was put on pause in November of 2017 so that a new authentication and verification program could be developed. Twitter has not been taking public submissions for account verification since then and there has been no news of a new verification program release date. According to Twitter, verified accounts are accounts that are of public interest. A verified Twitter account means that your account is authentic. It means that the person, brand or organization behind the account is legitimate—and that Twitter itself has verified the identity. Verified badges on Twitter accounts help followers distinguish the real accounts from the imposters (fan accounts, parody accounts etc.). Sometimes it's not so easy to tell the real ones from the fake ones — especially when imposter accounts use the name or logo to make it look as if it's authentic. Verification is really only necessary for high-profile individuals and well-known brands/organizations. A lot of people already know who or what they are, so there's a higher risk of seeing imposter accounts built around them. Some users try to trick their Twitter followers into believing that their account is verified by sneakily placing their own blue checkmark in other places like their profile photo, header photo or bio. If you see this on any account, don't fall for it. A real verified Twitter account will only have the official blue checkmark badges at the end of their full name, regardless of whether it's displayed on their profile, in a retweet, in search results or anywhere else. In addition to representing your authenticity, having that blue checkmark badge beside a name on Twitter also brings a certain degree of authority and importance to that particular account. Most Twitter users understand that if you're able to score a blue checkmark badge, then you're popular and influential enough to have both fans and haters who might want to praise you, copy you, hate you or make fun of you. You don't have to have the same level of fame or influence as an individual like Donald Trump or a brand like Coca-Cola. In fact, you'll see lots more individuals, brands and organization close to medium-level fame and influence having blue checkmark badges beside their usernames these days. Unfortunately, at this time, you can't submit a request to have your Twitter account to be reviewed for verification. As noted above, the official Twitter Verified and Support accounts made this announcement first in November of 2017 and then again in February of 2018. There has been no update since. The reason for putting it on hold has everything to do with how Twitter users see the blue checkmark badge more as a representation of importance than authenticity. In other words, it's perceived as an endorsement. Twitter users might not have a problem with this, but Twitter itself does. 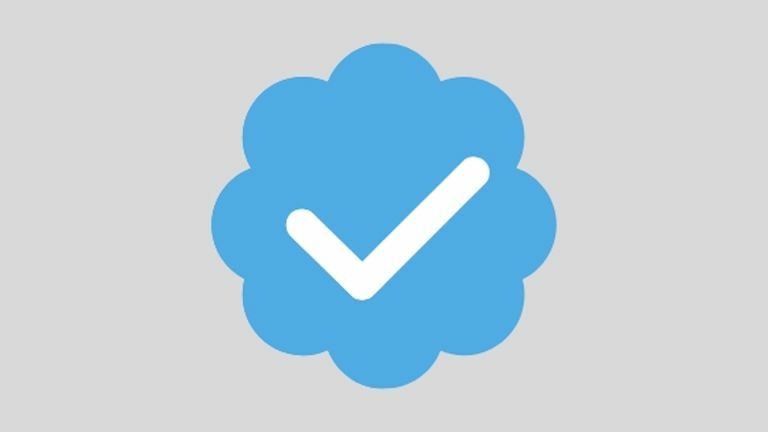 By giving verified users visual distinction, Twitter admitted to only helping to strengthen the perception of the blue checkmark badge being an endorsement. When Twitter decided to start accepting public submissions for verified accounts, the perception worsened as accounts that didn't deserve endorsement statuses were granted verification. Users couldn't understand why some accounts got verified while others didn't. Given that it's been well over a year since Twitter first made the announcement to halt all public submissions for account verification, you probably shouldn't hold your breath for the release date of its new verification program. You can still be just as influential as ever without a blue checkmark beside your name. Instead of focusing on trying to get your account verified, focus on optimizing your profile photo, header photo, bio, website and of course your tweets. As you build your following and your influence continues to grow, make sure you protect your account by enabling two-step login verification to keep hackers from accessing your account. Twitter was the first social network to have verified accounts, but since then, others like Facebook, Instagram, Pinterest and even Snapchat have introduced a verification feature of their own—many of which have some straightforward steps users can take to get their accounts verified. You might as well go try to get your other social accounts verified while you want around for Twitter. Maybe you got to submit a request for account verification just before Twitter put all all public submissions on hold and have been patiently yet anxiously waiting longer than a year for that blue checkmark to appear beside your name. If you did, it's unlikely at this point that Twitter is still going through those last few submissions and has simply decided not to grant your request. Nobody knows exactly what Twitter is up to with its account verification program, and since it was only mentioned that all "general" verifications have been paused in its original tweet from 2017, there's still the possibility that some accounts are still being granted verification status. If you see that blue checkmark appear next to your name, then you'll know it. According to Twitter's verified account FAQs, recently verified accounts are automatically required to provide personal information (such as a phone number and email address) for a password reset. Twitter also recommends that all verified accounts be cautious with connecting third-party apps, reviewing them regularly and revoking access to ones that look unfamiliar or aren't being used. Bear in mind that a verified Twitter account isn't necessarily forever and Twitter has the right to remove it at any time without notifying the account holder. Besides the risk of losing verification for inappropriate behavior, an account could also lose its verification status simply for changing any profile settings that alter the account's original purpose. If an account loses its verification status, Twitter might decide that it's not eligible to be restored.